SignTech™ is for everyone, who would like to fasten their business processes and reduce office costs. Effective solutions for smart people. SignTech’s Digital Form Builder delivers paperless business solutions to all kinds of organisations. 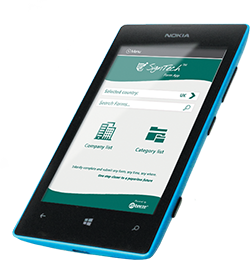 Our legally binding touchscreen e-signature technology lets you take all the forms you need wherever you need them and obtain a digital signature anytime, anywhere. The average time taken to convert your forms to paperless business forms using our digital form builder is just 2 hours. Other less efficient products on the market can take up to 9 weeks! SignTech's digital form builder and paperless business forms technology can create a .pdf formatted document, complete with signature if applicable and send it instantly anywhere in the world. With no more printing, paper and postage costs to meet, everybody wins. Overall processing time reduced by 80% thus your profits are enhanced and the environment benefits too! Using SignTech's paperless business solutions technology you can make your forms available on millions of touchscreen devices thus enabling users to complete paperless business forms and sign on the devices' touchscreen. The result - legally binding signatures on your paperless business forms in seconds! Your data processing costs are about to be slashed when you start to incorporate SignTech's paperless business solutions into your database or business applications. Data entry times are drastically reduced or eliminated completely and the possibility of manual errors occurring disappears forever.